This was a film that I absolutely owed a rewatch. The first time I saw Before the Devil Knows You’re Dead was a few years ago, and the circumstances were less than ideal. I was with two friends who didn’t like it at all and found it boring, and they wouldn’t shut up about it. Eventually, I just gave up on trying to focus on the film and we just started babbling about other things. I gave the film a low mark as a result, justifying it with “it failed to hold my attention”. While this is true, this is obviously not something that should be placed on the movie’s shoulders. When I thought about it a while ago, I realized I didn’t remember anything about the film itself other than the circumstances around seeing it. People seem to have a lot of love for it though, so it went onto my rental list. I’m glad I gave it another shot. Told in a non-chronological order, the film uses a botched robbery as its real kick-off point. A masked guy threatens the elderly shopkeeper (Rosemary Harris) with a gun, but the end result is both of them shooting each other. At this point in the film, we are not aware of who these people are. It’s soon revealed that the robbery was the brainchild of a corporate accountant named Andy (Philip Seymour Hoffman), who soon enlisted his weak-willed brother Hank (Ethan Hawke) to help him do the deed. Both are in urgent need of money: Andy to cover up his embezzling at work, Hank just to pay the rent and provide good living for his daughter. It was meant to be nice and simple: no guns, no bloodshed, no victims (the diamonds were all insured). As we now know, this is not how things turned out. This is a wise crime film in that it deals with ordinary people who are forced to deal with the fallout of a heist gone awry. They’re plagued by guilt over the people who died, they have to look after their distressed father (Albert Finney) who had ties to the store, and all the problems the robbery was supposed to take care of still remain. Andy was planning a vacation to Rio de Janeiro to liven up his strained marriage to Gina (Marisa Tomei), but now that’s out the window and the auditors at work are fast closing in on him. He also has a heroin addiction that needs feeding. Meanwhile, Hank is struggling to just get through the day financially, something not alleviated by him now being blackmailed by a man (Michael Shannon) who seems to know about his involvement in the robbery. 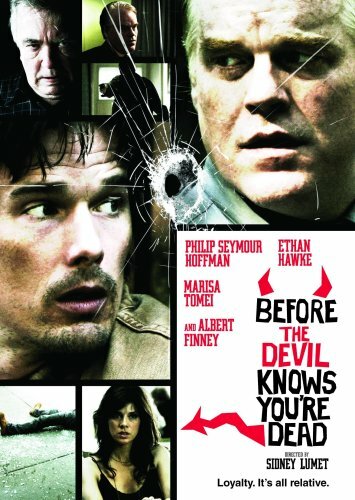 Before the Devil Knows You’re Dead is made by Sidney Lumet, highly acclaimed director of films such as 12 Angry Men, Network and Dog Day Afternoon. It was to be the last film he directed before he died in April this year. It’s a strong note to end a career on, even if not everything in the movie fully works. Perhaps my chief complaint is how little is done with the non-chronological structure. The opening robbery where we’re not sure what’s going on is effective, but apart from that, the constant back-and-forth jumping in time adds little to the film. This is a story that could have been told more straight-forwardly and still accomplish everything it needs to. The shifts in time and perspective are accompanied by flashing cuts and noise that distracts from the characters’ lives. Before the Devil Knows You’re Dead is many things, but seamless is not one of them. But it’s a fun story to behold no matter how it’s presented. It’s clear to see how one event leads to another and how the situation slowly but surely spirals out of control. This is a character-driven film free from contrived plot developments, and debuting screenwriter Kelly Masterson deserves a lot of praise for his work here. Philip Seymour Hoffman is one of my favorite actors working today, and he doesn’t disappoint here. His character Andy feels the most fleshed out of the main players, swaying from jovial smooth-talker to stressed-out volcano with ease. As he inches closer to the deep end, we’re with him every step of the way. Ethan Hawke also does a fine job as the easily manipulated Hank, more overtly nervous than his brother. It’s a role that doesn’t necessarily play to his strengths (to me Hawke shines in roles that put him in more ordinary situations like Before Sunset/Sunrise, Reality Bites and Fast Food Nation), but he pulls off a solid performance here. Albert Finney brings a weighty presence to the role as the father, really bursting with energy in a couple of choice scenes. And then there’s Marisa Tomei, constantly getting better with each passing year, here doing the most of what limited screentime she has and nailing every second of it. So yeah, I liked this movie. More than on my first watch, understandably, almost to the point where I wonder how any of us could have been bored with it. While there’s little extraordinary about the film, it’s a tight story where we’re clearly aware of the characters’ motives and reasonings throughout even when they’re not spelled out explicitly. I do wish the film could have provided a stronger sense of urgency at times. It feels a bit too methodical and distant at times, and some more tension would have been welcome. Regardless, it’s a well-acted film with a compelling story. Others have liked it more than me, so if it sounds appealing to you, don’t hesitate to check it out. It was a while since I saw this, but remember loving it (gave it a 9/10). Didn’t realise it was a Lumet movie. Glad to know you decided to give it a rewatch! This is one I definitely enjoyed and wouldn’t mind giving a re-watch. Probably would be rewarding. As I said, I didn’t remember anything about the film, so the story was pretty much new to me even on a second go-around. But even if one knows how it unfolds, I could still see this one growing for each time one sees it. What a lovely write up Emil! I haven’t seen this film, I feel like a should, it sounds like it is right up my street!! Muchos gracias! I hope you’ll enjoy it. It is a good one.